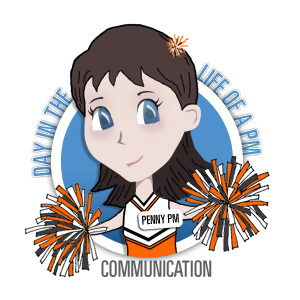 Penny PM says, “Communication is the soul of a project. It is important for a project manager to use various styles and methods of communication based on the content, the audience and organizational requirements.” A project manager has to be the cheerleader for the project team by being enthusiastic and vocal when the project is in a green status or a red status. Successful communication in a project environment creates a collaborative environment, informs all levels of the organization on the status of the project and acknowledges and persuades others to communicate effectively as well. To ensure effective team communication, Penny PM reviews the project team’s Communication Strategy with them. Penny PM notes that, “A communication strategy outlines the processes to ensure constant and effective communication within the team, onsite or remote, key stakeholders and business organizations we support.” To keep open communication amongst the team, the project team was moved into a open project environment eliminating cubes and offices to promote open collaboration and communication with the project team.